The term “x_sound” has a triple meaning: a sound that is unknown(x), that is ex-panded and that ex-pels fixed ideas about sound. “Sound” itself is literally a neutral and straightforward term, but in the contemporary art’s context, it’s a complex arena of different questions and discourses. Sound in experimental music opens up the possibility of overcoming the limitations of harmonious but canonized twelvetone music. Sound in visual art leads to the indeterminism of visual art, beyond ocularcentric perspectival space, and becomes an ingredient for expanding the concept of architectural space. The sound was a symbol of alternative art which goes against the rationalistic and evolutionary attitude of Western art, and therefore fascinated many contemporary artists, among whom are John Cage and Nam June Paik. Cage opened a new chapter in music with his 4’33” in which a performer sits at the piano and plays nothing for 4 minutes and 33 seconds. His experiments in the 1960s and Zen sensibility had great influence upon Paik. Inspired by Cage’s experimental music, Paik who had studied contemporary music in Japan and Germany paid homage to Cage and developed his mentor’s sound experiments into installation and performance work (a.k.a. “Action Music”). Now the typical ‘music’, consisting of melodies and rhythms, was expanded to include everyday ‘sound’ indistinguishable from ‘noise’ and even the audience’s response. Furthermore, Paik rendered the mechanisms of sound visible in space by applying such things as pieces of paper or toys to musical instruments, and also created more unexpected scenes by including the audience’s action in the performance. The exhibition will present proofs of their interaction with each other, as shown in Paik’s Hommage à John Cage (1958), Variation 5 (1965) and A Tribute to John Cage (1973). The waves initiated by Cage and then extended by Paik are generating certain resonances in sound installations by our contemporary artists with new media, new context, and above all, new sensibility. Kichul KIM (Korea), who has persistently explored the visualization of sound, arranges speakers emitting the sound of nature in the exhibition space in a way that they can maximize the associations of hearing and sight. Haroon MIRZA (UK), uses two kinds of sounds, one created by non-acoustic devices in everyday life, and the other produced by acoustic devices handled in unusual manners. ZIMOUN (Switzerland) uses a weird frictional sound in order to draw the audience into a structure made up of empty boxes vibrated by hundreds of small motors. Anri SALA (Albania) catches the emotional interaction between sound and space, by filming a break-up conversation. Susan PHILIPSZ (UK) edits various songs with rich but complex historical implications and sings them herself. She leads the audience to encounter her songs in an unexpected spot. Inspired by Cage’s experiment, Loris GRÉAUD (France) recorded the ‘silence’ made when Sonic Youth’s legendary guitarist Lee Ranaldo was ‘thinking’ about his music, and photographed the scene. And Otomo YOSHIHIDE (Japan), famous for his unique sound installations and performances, composes a concerto of different noises using dozens of turntables. The works of these artists do not make sound that you merely listen to in the exhibition room; rather, they show psychological and physical tensions caused by sound, an environment built up by sound, the ways in which sound mixes history and emotion, the ways in which sound crosses between mathematical order and chance, a close inquiry into the relationship among space-sound-body, and so on. 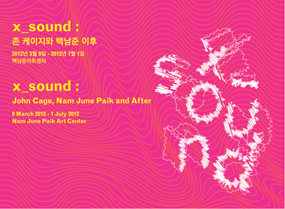 Various sound performances will also be presented along with the exhibition. On the opening day there will be a performance of John Cage’s Imaginary Landscape No.4 (1951), a ‘radio’ orchestra with twelve radio receivers by 24 students from the Department of Composition in Chugye University For The Arts and Yoshihide’s performance using turntables. During the exhibition period, a series of contemporary music concerts of Cage’s works will be held to facilitate the understanding of his music.